Our latest quarterly survey of businesses across China, conducted in May and June for the China Beige Book™, highlights the phenomenal growth e-tailers are experiencing there: they report soaring sales, big revenue gains and rising sales prices. But not only are these businesses booming; online sellers are out-performing bricks-and-mortar retailers across the board. These trends can’t be ignored by anyone interested in development – or in retail opportunities –as the world’s most populous nation shifts to a more consumer-focused economy. Retail in China is leapfrogging from traditional mom-and-pop stores to the internet age, as affluent and connected shoppers prefer the convenience of online shopping and out alternatives to lackluster local offerings. Our findings testify to the explosive growth of e-tailing in China, with retailers reporting an average 31% increase in online sales over the past year. The most rapid growth was in the food and automotive sectors. Regional patterns suggest online spending is driven by the presence of money and the absence of attractive retail offerings. Online sales expanded fastest in coastal Guangdong and Beijing, among the most advanced and affluent regions, and in the remote West, where major retailers are thinnest on the ground. Growth was also faster in the lower-tier cities (3-5), with far fewer desirable consumer outlets, than in the biggest metropoli (tiers 1 and 2). The extent to which Chinese retailers have clambered onto the online juggernaut was also striking: some 62% of retailers sold goods online, up 7 points in two years, either together with in-stores sales (55%) or exclusively via the internet (6%). These figures may be skewed upwards somewhat because our poll is conducted online, but they still show a broad reach for Chinese e-commerce. Predictably, foreign and Hong Kong-owned retailers have been much quicker adopters of e-commerce than mainland Chinese firms. Retailers operating both on- and off-line reported an average of 32% of their sales were online. 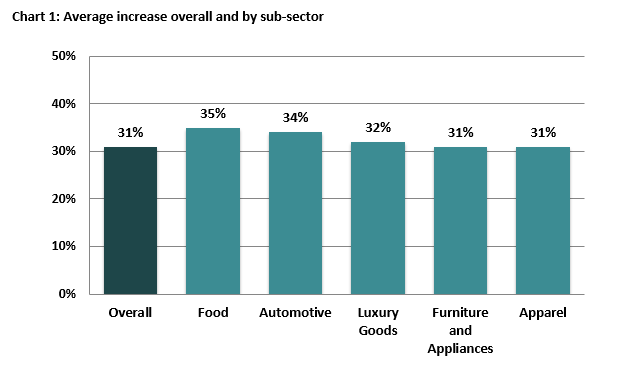 Online sales have made the biggest inroads in the luxury, automotive, and food sub-sectors. Online presence is seen by Chinese vendors as a key to customer awareness as well as sales. “Online channels account for 50% of sales, and publicity work is mainly done online,” an appliance store executive in Dongguan, Guangdong said. Online retailers can reach consumers as they are clicking and comparing in their homes or offices. Most stores-only retailers (57%) say their revenue has not been affected by online sellers; only one-sixth say they have been hurt by them. But our data suggest they are whistling in the dark. E-tailers performed far better in terms of revenue growth than bricks-and-mortar-only retailers. 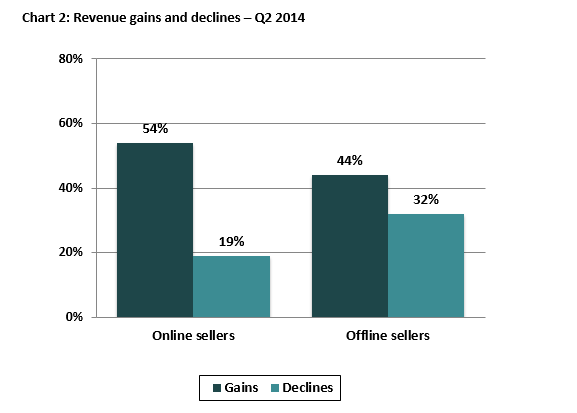 Online retailers reported fairly strong growth, revenues up at 54% and down at just 19%. In contrast, offline retailers’ revenues were little better than stagnant, up at 44%, down at 32%. The larger proportion where revenues are dropping among bricks-and-mortar retailers is particularly telling; the offline segment of the market is clearly starting to fall behind. Online retailers can also command better prices gains than their store-only competitors: 49% noted a rise in selling price, and 15% declines, since last quarter. Pricing growth was considerably more sluggish among those offline: 35% had increases, 19% decreases. Along with the ongoing rapid rise in internet connectivity in China, our findings underline the dramatic transformation of retail opportunities underway there. In a word, the future of the world’s largest retail market is: online! Shehzad Qazi, a Senior Project Manager at Charney Research, handles research for the China Beige Book™.